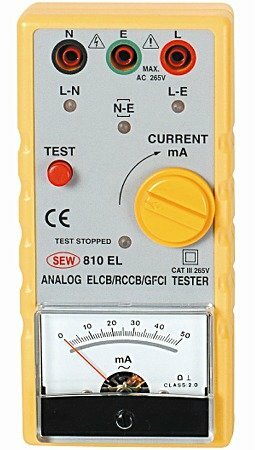 ● Can be used on 2 wires L-E (ELCB/RCCB/GFCI tester). ● Can be used on 3 wires L-E-N (with wiring check). ● Sense automatically 50 or 60 Hz. ● Current injected in phase with the voltage. ● Wide operating voltage (195Vac to 265Vac). ● Other voltage optional (110V).